We move this month from the fame of Elder, to a plant of relative obscurity that has been calling my attention. I am not sure whether it is growing in more abundance this year, or whether I am just noticing it more because it has chosen to move into my garden. Hedge Woundwort is a tall, hairy perennial that grows in hedges, woods and on waste ground, where its tall spires of crimson-purple flowers stand out among the lushness of green growth of other plants. The flowers are arranged in whorls around the central stem. They are hooded, with the lower lip beautifully variegated with white against the crimson background. Bees love this plant and are frequent visitors. The whole plant has a fairly pungent even foetid smell, which is not particularly pleasant. It has dark green pointed-oval leaves that are stalked and toothed. As its name suggests it has been used as a wound-healing herb and enjoyed quite a reputation in the past, as its other name, Allheal, suggests. Culpeper tells us that it is “inferior to none” in its ability to heal wounds. Although it is little used today it appears that it is a very powerful remedy that we should know more about. As well as being healing to the tissues, it also arrests bleeding and is an antiseptic. I am certainly going to make use of it myself as a first aid remedy. Woundwort’s latin name is Stachys sylvatica, and it is related to a better known herb , Wood Betony, Stachys betonica, to which it bears some resemblance. They both belong to the Labiatae family and like other members of this family it has a square stem, though this is solid and full of pith, not hollow. 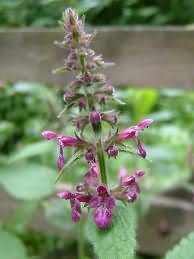 Its aroma is very similar to that of Black Horehound, Balotta nigra, another close relative. Like these two plant relatives, Woundwort has antispasmodic and sedative properties when taken internally. I have found references in old herbals to it being used for menstrual and ovary pain, cramps and aching joints. My personal subjective experience with Woundwort was that it has an uplifting effect on the spirits and I was pleased to find the following confirmation of this in an old herbal: ‘a distilled water of the flowers makes the heart merry, to make a good colour in the face, and to make the vitall spirits more fresh and lively’. ‘a very poor man in mowing of Peason did cut his leg with the Seith, wherin he made a wound to the bones, and withal very large and wide, and also with great effusion of blood, the poor man crept unto this herb which he brused with his hands, and tied a great quantitie of it unto the wound with a piece of his shirt’. He was soon well, poulticing the wound ecah day with the herb made into a salve with lard. Gerard saw the wound and offered to treat the wound for free, but the man refused saying he could heal it as well himself, which Gerard thought was a clownish answer, whereupon he named the plant ‘Clounes Woundwort’. Gerard was so impressed by the speedy healing of the wound, which took only a week, that he tell us that he went on to use this wonderful herb to heal gentleman badly wounded in pub brawls in Elizabethan London, and a shoemaker’s servant who stabbed himself in the stomach and in the throat- ‘a most mortall wound…in such sort, that when I gave him drink it came forth at the wound, and likewise did blowe out a candle’. Pick a bunch of the herb during its flowering period. Cut it up and bruise it in a pestle and mortar, or give it a good bash with a rolling pin. Place it in a double-boiler (or in a basin over a pan of boiling water) and just cover with olive oil. Apply gentle heat for 2-3 hours. Avoid too much heat or the herbs get deep-fried. Strain the herb through a cloth and measure the oil. For every 100mls of oil you will need 10g of beeswax. Heat the oil again and stir in the bees wax until melted, then pour into clean glass pots and leave to cool and set. This ointment can be used for all cuts and scratches, making sure the wound has been thoroughly cleaned before applying it. Keep the ointment in the fridge to prolong its shelf life.